Experience Darwin’s most iconic music festival this dry season. People’s Choice BASSINTHEGRASS Music Festival returns to Darwin and is bigger than ever with a brand new beachside location and a stellar line up of Aussie artists. Set to be held at Mindil Beach on May 18, goers will be able to enjoy 12 hours of non-stop entertainment at the new seaside location featuring unmissable musical goodness across three massive stages. You’d be mad to miss this top notch line up, with some of the nation’s biggest names ready to party Darwin-style at this iconic music festival. 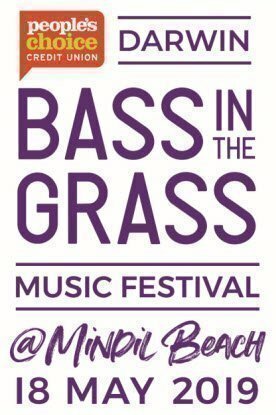 Make sure you check out the updates on our Facebook page and www.bassinthegrass.com.au. Don’t miss out and buy your tickets now. GENERAL ADMISSION tickets start from $105 and Platinum Package tickets from $220. As there are limited tickets available, this event will sell out. People’s Choice BASSINTHEGRASS Music Festival is proudly supported by the Northern Territory Government. - Please ensure you read the Ticketing Terms and Conditions prior to purchasing your BASS ticket.